These tours are designed in mind for those serious Great Wall hikers who have a little more time on their hands than the average traveler. This is some serious hiking, so please be in the right physical condition to handle the strenuous activity involved for these programs. These hikes take you to the best Great Wall spots, from the classic Jinshanling-Gubeikou hikes (as well as Jinakou-Mutianyu) and the fascinating Huangyaguan, to the more unknown and wild sections like Xishuiyu and Panlongshan. All of these areas of the Great Wall feature dramatic vistas and postcard-like scenes, so please remember to have your camera with you! In addition to the Great Wall you'll also get to take in some of China's lesser-known sites and explore the Chinese countryside, where the majority of China's population lives. You'll get a brief insight into how people truly live in China, which is a stark contrast away from the big cities. You'll get to interact with villagers, try the local countryside cuisines, and sleep in their homes, making for a truly authentic experience! For those that have already explored the more well-known and touristy sections of the wall, then this tour will be a welcome change. 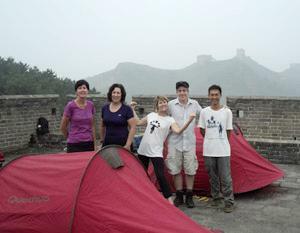 Please join us for a five day hike that will give you a whole new perspective of the Great Wall!